Nope, the topic of this afternoon’s post isn’t wedding karaoke or even new craze marryoke, but instead brides shaking up tradition by choosing to make a speech on their wedding day. Gasp you might, as this is a duty usually dealt to the groom, father-of-the-bride and best man, but no longer are speeches considered a male-only zone, as mothers, maids of honour and brides themselves are stepping up to the mark and relishing in the opportunity to address and entertain guests with their memories, anecdotes and well wishes. And with bride-to-be of the moment Meghan Markle, set to be making a speech at the royal wedding, we can only see this emerging trend continuing to grow. 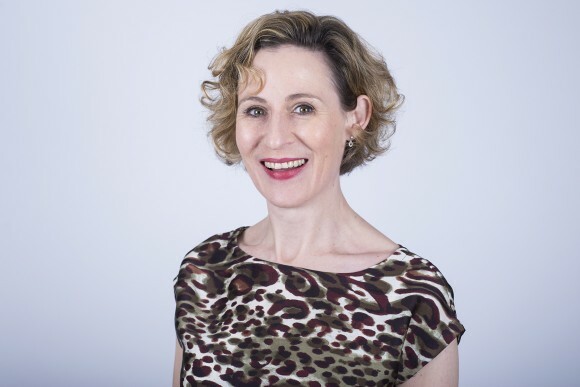 As such, we’ve invited an expert in the field to the blog today to inspire and inform you ladies on how to smash public speaking – please welcome our wonderful Sponsor, Emma of Emma Taylor Presents. 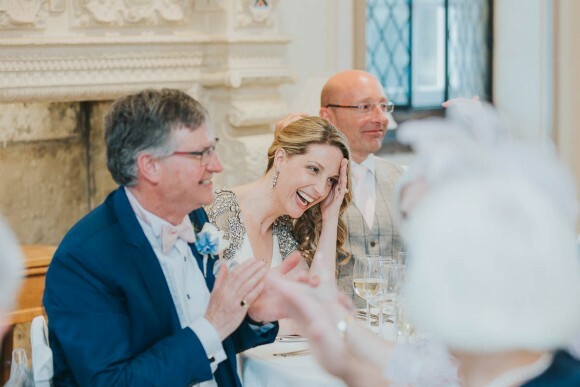 The fairy godmother of wedding speeches, Emma offers a series of group workshops and one-to-one coaching sessions on how to nail that moment in the limelight, covering everything from content and structure to the delivery. 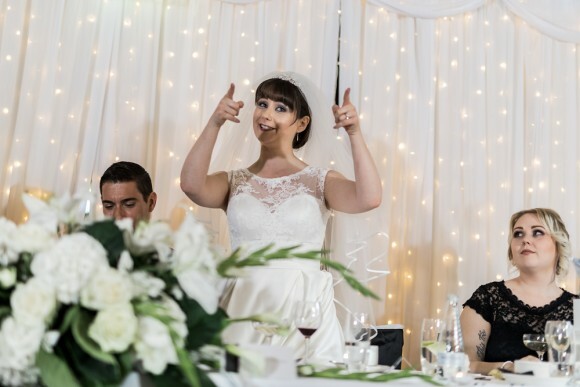 It’s becoming increasingly popular for brides to make a speech on their wedding day, why would you say that is? emma says: In an age of equality, it seems very odd that the bride – who has usually ploughed copious amounts of time and money into making her big day one to enjoy and remember – should sit mute when the time comes to formally speak about the day. Very often if brides work in positions where they have to present regularly, they know they’re decent speakers and that they can handle a speech. They think, ‘well if the chaps are doing it, it seems strange that I wouldn’t.’ Meghan Markle will give a speech at her wedding, and is any one surprised? She’s a modern, capable professional. What are the main considerations for brides to think about if they do want to make a speech on their wedding day? What content could they include? She needs to understand the speech responsibilities of the other speakers and make sure she doesn’t stray into their territory. In terms of a content roadmap, the bride should open by thanking her maid of honour and bridesmaids for all their support. A funny hen do anecdote that captures the fun and dedication of her top girl team will always go down well. It needs to be pithy though; edit out the dull bits but expand and play out the big, humorous moments. The bride should thank her family and the groom’s family for any outstanding non-financial help they’ve given. She should let the groom thank the families for monetary contributions. She could remark on the hours her mum put in accompanying her to wedding fairs and dress fittings. If she fears she’s been a bit Bridezilla during the planning process, then now’s the time to fess up and apologise. She could finish by proposing a toast to the continued health and happiness of her parents and parents-in-law. In what ways can you help brides with the construction and delivery of their speech? I can help her to select the best material and eek out as much entertainment from it as possible. I can help her structure it so it flows beautifully and doesn’t jump jerkily from one section to the next. And I can help her give a poised performance so that she won’t cringe and want to hit fast-forward when she watches her video back. 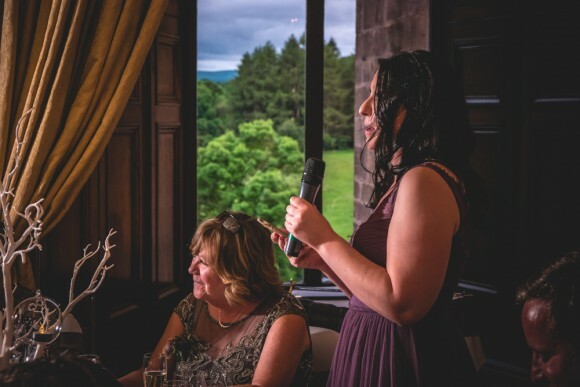 How can a bride making a speech add to the wedding day and why would you encourage ladies to take to the mic? The fact is that even if the bride doesn’t intend to make a speech, she’ll most probably be called upon to do so. Guests love hearing from the bride. And, like anything in life, it’s always best to be prepared. So I think brides who feel confident about speaking should state that they will speak – guests will look forward to it – and for those who don’t feel confident, they should prepare a speech anyway in case their guests start to chant their name and demand a few words, and the poor bride suddenly realises that if she doesn’t take to the mic she’ll look impolite and disappoint them. What would you say to brides who like the idea of making a speech but that are nervous about public speaking? The same as I say to all wedding speakers. Do your preparation; good prep is the fountain of all confidence. Accept that adrenalin will be in the body before you speak but manage it by controlling your hands and feet and breathe in deeply through the nose. Remember too that everyone there is willing you to do brilliantly. You’re their woman. Think how warmly Adele would be received at the Brixton Academy or Lady Gaga at Carnegie Hall – well your guests are going to respond to your performance with that same level of warmth and affinity. What for you are the key ingredients to a good bride speech? Humour, confidence and enjoyment. 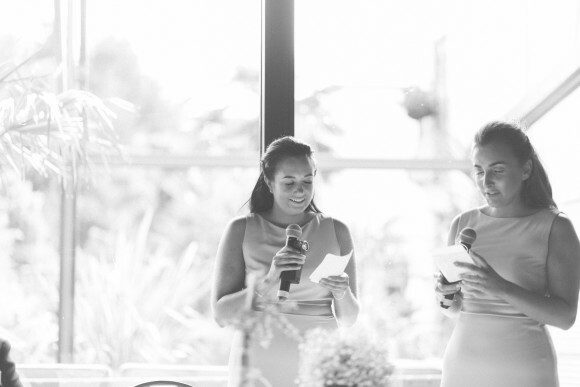 Although brides are more than capable of delivering a witty, polished speech, a lot of guests are surprised when they actually do. Although guests like to hear from the bride, they often expect her contribution to be a nervy, giddy, teary few words, so when their expectation is completely subverted, and she storms it, it’s just brilliant. 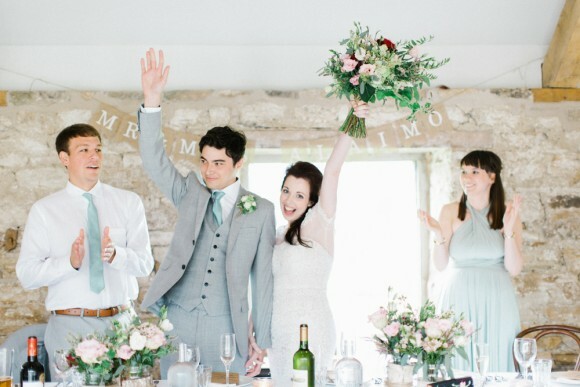 What is the feedback like from brides who you have helped to construct a wedding speech? The feedback’s been great. Brides typically love the planning stage; talking through their material and polishing it. Although, as they do this, the majority are nervous about actually delivering the speech. After they have, however, they are very pleased that they took to the mic, and this is largely for posterity’s sake. They’re thrilled that their children and grandchildren will be able to watch them addressing their nearest and dearest while looking stunning on such a special day. Are there any other female members of the bridal party that you would encourage to consider making a speech on the wedding day and how can this shake up traditions? If the bride’s father isn’t present to give a speech, or is there but can’t, then the mother-of-the-bride should speak. Again, because we’re not used to hearing female voices give wedding speeches, this speech role will often be performed by the bride’s brother or uncle if her father can’t do it instead of her mum. But everyone would prefer to hear from the woman who raised the bride, so she should put herself forward. If the bride’s father is going to give a speech but he’s a quiet, unassuming chap whose speech will be short and not necessarily sweet then the bride might like to ask her maid of honour to say a few words too; especially if she’s a lively, confident character who’s a born raconteur. Her speech is essentially a best man’s speech, though it should be shorter. Where can brides find out more details about the one to one coaching and group workshops that you offer? It’s best if they visit my website, all details are there. Follow the content roadmap I detailed earlier. Don’t stray too much from it. A bride’s speech should be no longer than seven minutes. Don’t be in a rush to write. Take time to consider what your best material is. Read the speech out loud. Are you tripping over certain words or sentences? If so, edit them so you sound fluid. Kick your shoes off before you stand to speak. You’ll want to look grounded and confident, and stilettos rarely help with that. Don’t fight your emotions. If you cry, it’s fine.